The Orange brigade from Imphal completed their 2nd Division League conquest in style as they outran a wayward Southern Samity side and handed them a 4-1 defeat. A fine brace from Pritam Singh (25', 36'), a goal piece from Subash Singh (57') and Felix Chidi (61') secured the victory for the hosts after conceding an early goal by ace striker Ashim Biswas (10'). Neroca FC, who earned promotion to I-League after defeating Kashmir FC with a similar score last week, finish their National Finals with 26 points from 10 matches comprising of 8 wins and 2 draws whereas second-placed Southern Samity stays nine points shy having played an equal number of matches. 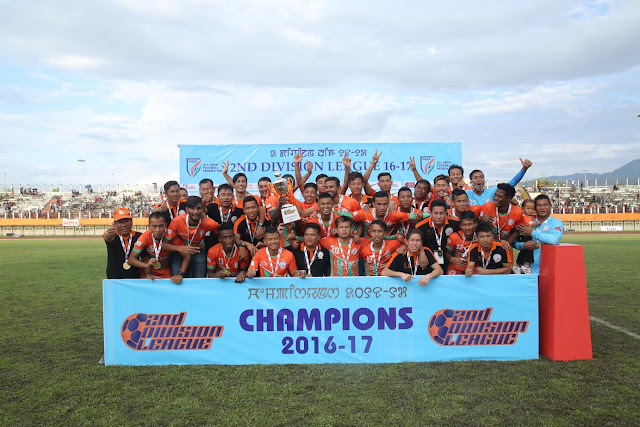 They also became the first team from Manipur to win the league and earn promotion to country's top division. Former Manipuri stars lauded Neroca FC's feat of winning the Second Division League and becoming the first Club from the State to scale the height. "It is a huge achievement,” commented Renedy Singh, arguably the biggest name to have emerged from Manipur’s galaxy. “The win came at the right time which will prove worthwhile for not only the Club but for Indian Football as a whole,” he stated. Former Indian international, Gouramangi Singh couldn't hold his emotions back while explaining Neroca's FC achievement. "It is probably the best ever 'collective' advertisement of Manipuri Football till now. I have been following Neroca FC since their inception. The management have shown a real intent the results are there for all to see. On a scale of 10, I would give them full marks –10 out of 10,” he maintained. He added: "Since the zonal round, they have played like true champions and eventually lifted the silverware." Surkumar Singh, the resolute ex-National Team right back described Neroca FC's win from a different point. "Neroca’s win will have a terrific impact on the youngsters who want to take Football as a career option. The parents will look forward to encouraging their kids to play the game with more seriousness,” he felt. Surkumar quipped: "Had we had a Team from Manipur during out playing days, we would have emerged as the best Team. I wish I was 20 again and I could play for Neroca,” he smiled. "Neroca FC came very close last year too but others pipped them to make the cut. I would credit them to not lose the hope. They had to push the limits this year to overcome the barrier and they rightly did so,” Gouramangi pronounced.